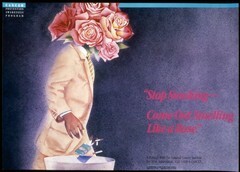 The poster "Stop Smoking-Come Out Smelling Like A Rose" shows an illustration of a professional man, with a bouquet of roses in place of his head, tossing a pack of cigarettes into a trash can. The title is in red lettering on a purple background. The man's suit is camel colored.